In September, we dedicated three weeks of our Community Studio program to unpacking the significance of quilting in Appalachian culture. Framing quilting within the history of folk art, we discussed how folk art traditions are deeply rooted in community and culture, which makes them expressions of cultural identity. FOLK ART reflects traditional art forms of diverse community groups – ethnic, tribal, religious, occupational, geographical, age- or gender-based – who identify with each other and society at large. FOLK ARTISTS traditionally learn skills and techniques through apprenticeships in informal community settings, though they may also be formally educated. MASTER FOLK ARTISTS demonstrate superior levels of craftsmanship and creativity, often introducing new materials and innovations that express both traditional and contemporary imagery and values. In this way, traditional folk art forms evolve as dynamic living traditions. FOLK ART fosters connections between art and people with a creative spirit that unites all the cultures of the world. Quilting is especially interesting in that it is traditionally a women’s folk art tradition, and quilts were often made communally by groups of women at gatherings called “quilting bees.” Usually held between periods of high demand for farm labor, these gatherings were significant events in many communities. Often, quilts would be made to commemorate important life events such as marriage, the birth of a child, a family member leaving home, or a graduation. In this way, quilts carry with them narrative significance for those who have been historically voiceless. Grandma Moses, The Quilting Bee, 1950. How could we use quilting to convey our narratives and our voices? The artists contemplated this question while receiving a crash course in basic quilting techniques (such as patchwork, or “piecing”) and forms (such as the “crazy quilt”). Our artists were especially interested in the colorful abstract quilts by the Gee’s Bend Quiltmakers, who hail from a remote black community in Alabama and are known for their long history of quilted masterpieces. Our artists then set to work thinking about how they might create a quilt square of their own using the techniques and histories we discussed as their guides. Instead of taking a traditional approach, however, the artists were allowed free reign with the materials, and their resulting compositions exhibit an exciting energy and dynamism. As we learned during our September 16th Community Studio, quilts are not simply beautiful objects; they also perform an important social function. In our September 23rd Community Studio, we expanded on this idea and looked at how quilts and quilting traditions have influenced makers, inspired new forms, and become part of the cultural landscape. The previous week, we had touched on quilts as narrative vehicles that gave voice to the voiceless. The history of African-American quilting offers a perfect example of this, as it began during slavery and evolved into a distinctive and rich tradition. Harriet Powers, 1898 bible quilt. The influence of this tradition can even be seen in 20th century African-American painting. Artists such as Jacob Lawrence and Horace Pippin are known for painting flat blocks of color, pieced together in compositions that almost resemble patchwork. Jacob Lawrence, Barber Shop, 1946. We then looked at artist Faith Ringgold and her narrative quilts inspired by these histories. Depicting her life and her surroundings, Ringgold’s work fuses traditional quilting techniques with painted canvas. Her compositions tell complex stories that often include figures and text. Faith Ringgold, Street Story, 1985. Another example of narrative quiltmaking in which quilts figure as commemorative, elegiac objects of resistance is the NAMES Project AIDS Memorial Quilt. The quilt is a memorial to and celebration of the lives of people lost to the AIDS pandemic. Each panel is 3 feet by 6 feet (approximately the size of the average grave). With more than 48,000 individual panels, the quilt still only accounts for about 20% of the people lost to AIDS-related causes. The Quilt is maintained and displayed by The NAMES Project Foundation, which was nominated for a Nobel Peace Prize in 1989. The artists looked at these and other examples for reference, and then were asked to consider how they might make a narrative quilt square that commemorated something about important about their life. As the artists crafted their narrative quilt squares from paper and mixed media, we discussed the role of quilting in Appalachian culture and how the barn quilt phenomenon came to be. 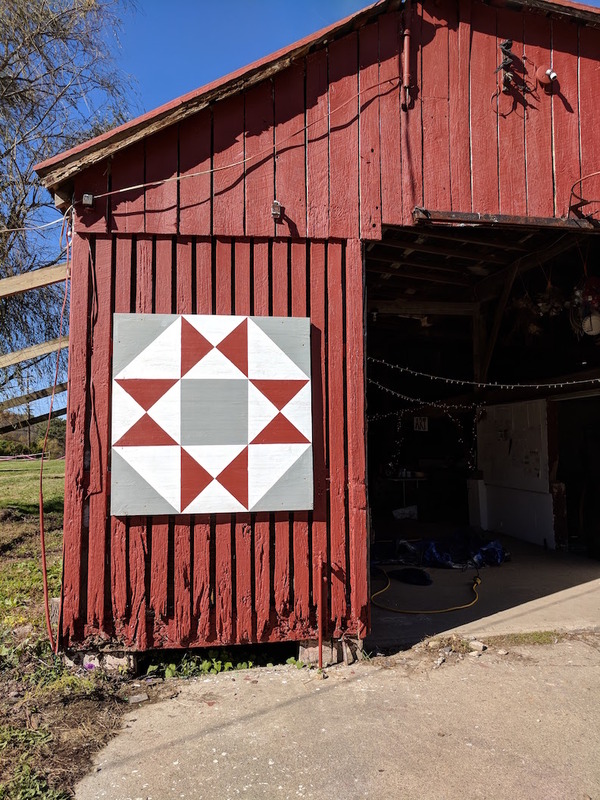 Barn quilts, in fact, originated right here in Ohio’s Adam’s County in 2001, when Donna Sue Groves decided to honor her mother’s Appalachian heritage by hanging a painted quilt square on her barn. Through her work with the Ohio Arts Council, Groves was inspired to expand the practice. She developed the idea for a “sampler” of quilts that would create a driving trail across the countryside, inviting visitors to take notice of important sites in her community. Now, quilt trails are created by quilt guilds, civic groups, local arts councils, 4-H clubs, school groups, and other organizations across the country. More than 7,000 quilts are part of organized trails today. The patterns chosen by barn owners often have special meanings and are derived from traditional quilt square patterns. We focused on the “Ohio Star” pattern, which carries a very interesting history. According to quilt scholar Barbara Brackman, the Ohio Star first appeared in Oberlin, Ohio, during the Civil War. Anti-slavery fighter, John Brown, recruited Lewis Sheridan Leary to fight for his cause. Tragically, both men were killed. Leary’s wife, Mary Patterson Leary, learned of his passing when her husband’s shawl was returned to her riddled with bullet holes. The Ohio Star quilt pattern was created in Mary’s honor to commemorate those who sacrificed their lives to fight against slavery. We announced that we would collaboratively make our own barn quilt to hang on the Barn Studio and mark it as an important landmark, and after much deliberation and sketching, we collectively decided that a simple Ohio Star would be the best pattern to represent our belief in freedom, justice, and pride of place. Over the next few weeks, many of our artists would help us create the perfect barn quilt, and it now hangs proudly at the entrance to the Barn Studio. Thank you to all the artists who participated! Our final week dedicated to quilts was a very special Community Studio. One of our regular students, Emma, invited all of her friends to come to art class with her, and we had a full house! This was also a special lesson because we would be talking about Bethel’s history as an abolitionist town and its involvement in the Underground Railroad. In fact, Bethel was founded in 1798 by Obed Denham as a haven for abolitionists like himself. While many Clermont County towns included stops on the Underground Railroad, its proximity to the Kentucky border made it a dangerous place for runaway slaves and abolitionists alike, and various techniques were employed to maintain the Underground Railroad’s secrecy. Messages were conveyed through code words and passwords, drumming stones together, the hoot of an owl, songs, lanterns, and knocks on doors. In an effort to better understand this language of sounds and codes, the artists were asked to perform a little exercise. “Forest of Sounds” is an exercise developed by Augusto Boal for the Theatre of the Oppressed (see “Community Studios: Week 3 Highlights” for more information). In this exercise, partners are tasked with communicating only via an agreed-upon system of sounds. Blindfolded, the partners must lead each other through the space using their sound systems. We decided to tweak this exercise a little, and our Community Studio artists were asked to imagine they were in a situation in which they could only use sound to communicate. Each pair came up with a system that would convey directions, and they took turns leading one another using only sound. Some have speculated that quilts encoded with secret messages might have been used to communicate with escaping slaves. However, this cannot be confirmed and is the source of some controversy. This quilt features the “North Star” pattern, symbolizing freedom, and a poem decrying the evils of slavery. Regardless of whether or not coded quilts were used as part of the Underground Railroad, the concept of “freedom quilts” has become a piece of the rich mythology that helps us understand the time period. There are contemporary “freedom quilts” as well. Mixed media and textile artist Aminah Robinson was commissioned by Cincinnati’s National Underground Railroad Freedom Center to create two enormous textile artworks that tell the story of the slave trade from Africa to America. She referred to these works as “RagGonNons” – complex works that are never finished. Perhaps Robinson wanted visitors to the Freedom Center to understand that the legacy of slavery is a story never finished. Our Community Studio artists had a lot of questions about slavery and whether or not it exists today. We explained that in this country slavery is no longer legal, but despite this, not everyone is free. We asked the artists to think about what might make a person not free – even in their own community. Then, we invited our artists to imagine and illustrate ways in which their community might be made better. When we had all completed our squares, we sewed them together, presenting our ideas for the future of Bethel in the form of a quilt. Many of the artists shared stories of how opioid addiction has become a part of daily life in Bethel and how they want to change that. We collectively imagined futures in which Bethel was once again healthy, nourished, and free.